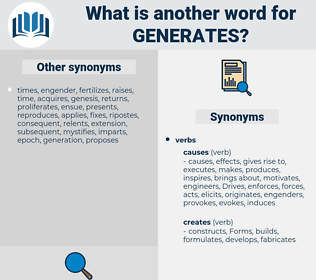 What is another word for generates? results, sources, raises, renders, returns, yields, fuels, Walkers, deploys. Resulted, raised, built, led, Bred. 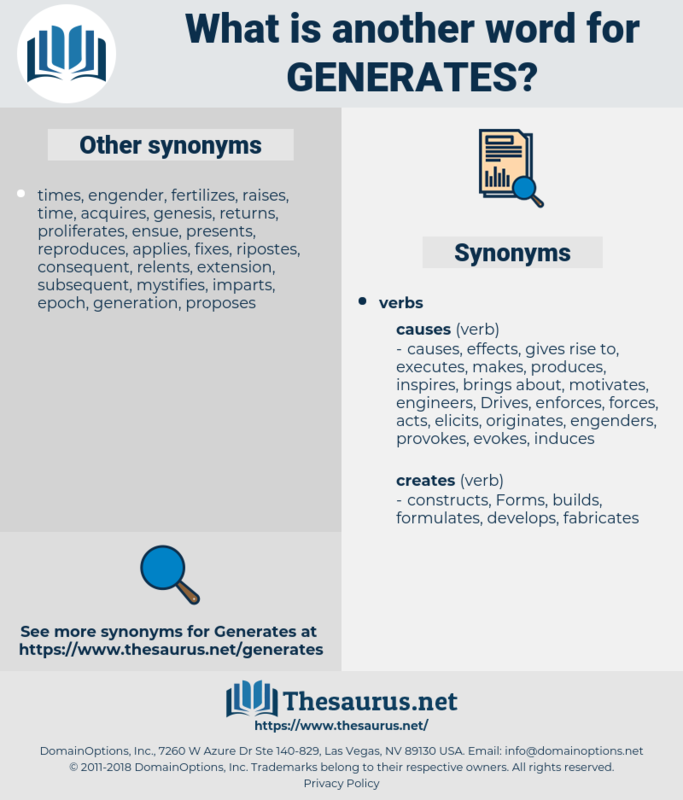 creates, originates, translates, initiates, incorporates, generator, stimulated, stimulates, investigates, triggers, arranges, gathers, accumulated, formulates, earns, facilitates, contributes, Guarantees, Producing, illustrates, necessitates, calculates, encourages, creation, attracts, incites, constitutes, consolidates, represents, promotes, culminates, manufactures, collates, sustains, simulates, extracts, relates, brings, liberates, obtains, attained, communicates, manages, constructs, transmits, arouses, nurtures, exists, Establishing, establishes, provokes, equates, catches, invites, sparks, inspires, dictates, populates, production, suggests, vacates, acquires, arises, Gains, forge, stipulates, entrains, causes, elicits, collects, denotes, corresponds, entail, Entailed, entails, enables, engages, derives, presents, captures, induced, induces, argues, achieves, unites, pertains, maintains, introduces, awakens, trains, identifies, emerges, fosters, prepares, open, opens, emits, develops, furthers, prefers, transports, governs, ensures, is, tends, procures, accrues, enjoys, infers, enhances, reports, portrays, prompts, occurs, builds, compiles, stirs, draws, outputs, spawns, outlines, furnishes, empowers, incurs, distorts, accountable, enters, instils, origin, directs, instills, reflects, assembles, happens, designs, PAVES, determines, encompasses, source, Bears, files, stems, turns, defines, equals, informs, supplies, carriage, inflicts, employs, supports, grows, comprises, feeds, authorizes, receives, signifies, boosts, combines, reveals, increases, involves, spurs, leads, teaches, proposes, depicts, poses, assumes, secures, certifies, evokes, Lends, invokes, Strikes, broadcasts, submits, gets, adds, favours, unleashes, amounts, relieves, accompanies, implies, imposes, sets, Rallies, reduces, publishes, takes, issues, shapes, Carries, launches, confers, Has, affords, Comes, requires, frees, lifts, consists, purchases, embodies, Permits, performs, inquires, entitles, allows, Drives, misleads, succeeds, fails, clears, Gives, specifies, lays, sends, accounts, move, releases, reads, assists, ends, commands, presupposes, eggs, form, Forms, throws, stands, finds, means, behaves, displays, casts, prescribes, offers, favors, expresses, holds, spins, spells, shoots, announces, presumes, fixes, cares, coach, underlies, helps, places, marks, des, serves, wins, hits, seeks, puts, handicaps, melts, results, sees, sources, pays, levers, raises, says, begs, asks, pulls, runs, buys, thinks, Worries, keeps, calls, renders, meets, lets, Focuses, makes, returns, believes, yields, fuels, wishes, Does, breeds, begets, Leaves.